We finally put up an ad looking for one (or maybe two, I’m still not sure if Latika is staying) new housemates for next year. When I happened to be using a Google map of Ann Arbor it struck me that we can honestly say our house is “centrally located”. 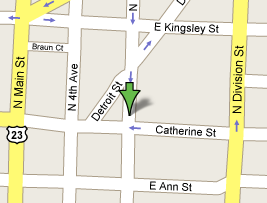 Check it out: a search for “Ann Arbor” points to our very own block, though on the other side. We are beat out only by the likes of the Ann Arbor offices of Weather Underground and Mysore Woodlands. A room is available in a six-bedroom, two-story house with friendly graduate studentish people (in fields such as anthropology, physics, and archeology). The house is on a quiet and very convenient tree-lined street near Kerrytown. The house has a large kitchen, two full bathrooms, free off-street parking, free washer and dryer, a living room, small reading room/dining room, very large basement storage space, a “mud room” for bikes and other storage, and a cable internet connection with wired and wireless networks. It is ten minutes walking distance to the UM Central Campus, even less to the Medical Campus, and on a bus route to North Campus (#1). It is one block from Kerrytown, Zingermann’s deli, the Farmer’s Market, and The People’s Food Co-op; and only minutes from downtown Ann Arbor. We’d like to find considerate, environmentally-minded people with which we could enjoy sharing a drink and some chit-chat. If you enjoy life and keep the sink relatively clear of dishes we should be able to get along. You don’t have to be a non-smoker, but please no smoking inside. The cost of all utilities (including the internet connection and some common kitchen supplies) is an additional $65/person/month averaged over the whole year.